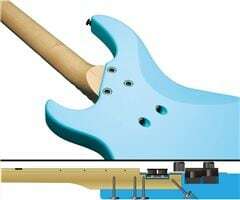 Yamaha thinks that there isn’t enough of a lefty market for the flagship Billy Sheehan signature Attitude bass. I think they’re probably right but I’m curious if anyone here would want to own an Attitude 3 bass and if you’d pay the price for one? Only 2 colours that I don't like either of. Distracting fingerboard treatment. And of course you can't reverse string it - well you could but then scallops makes no sense. The neck pocket/bolting design doesn't look as strong as they think it is. Better hope there are no voids in the splined insert jointing of the 3 piece body (do they x-ray to check?). I want wood not glue. 2 jacks therefore 2 cables for stereo? Presumably so they are both TRS for balanced. I don't think balanced is necessary for buffered active circuits & a single TRS cable is better if you want stereo. That said, 2 jacks are probably more convenient in the studio, I just wouldn't want 2 on cables on stage. Look at those back angled neck bolts. A backyard bodge if I ever saw one. Hope the neck angle is right first time for you, because it won't be an easy shim job to change it. Also, its going to prone to splitting from the bolt force - the pocket "shelf" is very thin. If the aim is to make it as solid as a through neck, then for the money, it might have been a through neck. Hahaha I did not know about that feature! The engineer who came up with that should probably get the firing squad. Why have Position Markers if you only have 6 frets?